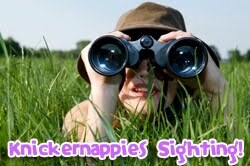 Did someone say a Knickernappies One Size Diaper GIVEAWAY? Why yes, yes we did! Head on over to The Cloth Diaper Revival's blog and enter for your chance to win a KN One Size diaper. If you've never tried one of our diapers you'll be pleased by the thorough review Jenny writes to accompany the giveaway. Open to the US and Canada!! Click here to enter. Quick fix wipes solution? Giveaway ahead! Irresistibly Green's October giveaway features a box of our very own Baby Bum Drops up for grabs. Hurry though, the giveaway ends on Halloween! Click here to enter. Speaking of wipes solution consider buying a box of your own! For just $14.00 you can purchase a box of Baby Bum Drops from Irresistibly Green. Not convinced if it's worth your time? Read our review here with a price break down to see if you think it can match up. Do you live in a place where space is limited? If so, chances are you won't have room for a diaper pail which is why our Doorknob Diaper Pail is an excellent way to save space and store your diapers properly before laundry day. Check out Diaper Safari to get yours today. Also, check out what Maria, of Change Diapers, has to say about our diaper pail on the Kelly Wels blog here.